Call us at (515) 223-1266 today. Welcome to Valley Eye Clinic! We are an independent, locally owned optometry office located in West Des Moines Iowa. Dr. Matthew Ward and the team at Valley Eye clinic strive to provide the best in optometric services. Our mission is to challenge the status quo, resulting in a exceptional experience for the entire family. Valley Eye Clinic is a full service eye and vision care provider, accepting both eye emergencies as well as scheduled appointments. Patients throughout the West Des Moines area come to Valley Eye Clinic because they know they will receive the personal attention and professional care that Dr. Larry Swanger has been providing for the last 40 years. Our team is dedicated to keeping our patients comfortable and well-informed at all times. At Valley Eye Clinic, we will explain every exam and procedure and answer all of our patients' questions. Additionally, at Valley Eye Clinic, we offer vision financing options and will work with vision insurance providers to ensure good eye health and vision care for all of our patients. Our one-on-one approach to optometry makes Valley Eye Clinic the vision care providers of choice in the West Des Moines area. Dr. Matthew Ward has also specialized in the diagnosis and treatment of dry eye in Des Moines for the last four years. Meet our friendly staff at Valley Eye Clinic! Dr. Matthew Ward - Originally from Ankeny, Iowa, Dr. Ward attended Dowling Catholic High School in Des Moines and Creighton University in Omaha, Nebraska. He received his doctorate degree from The Ohio State University College of Optometry. Dr. Ward suffers from dry eye himself, and has made it his personal and professional mission to provide the most comprehensive, up to date evaluation of dry eye and ocular surface disease. Away from the office, Dr. Ward enjoys spending time with his wife and 4 children, playing ultimate frisbee, weight lifting, and outdoor adventure sports. Valley Eye Clinic the Spring of 2018. Stephanie Beck was born and raised in Des. Moines, Iowa. After graduating she went into the Optical business in 1980. Stephanie has been with VEC for 29 years. Her passion is Optical management. She enjoys frame styling and lens selection and fitting. She lives south of Des. Moines on an acreage with husband Jon and 4 dogs. Outside of work she relaxes with reading, cooking and antiquing. Heather is originally from Ankeny. She has been involved in the optometric field as an optometric assistant for the past 6 years. She enjoys building relationships with patients and assisting with other office needs. Outside of work, her hobbies include working out, spending time with friends and watching Netflix. Pauli has lived in the Valley Junction area for over 25 years, and spent most of her career in the legal industry as a secretary. She has been a patient of Valley Eye Clinic for many years, so when a part time position arose, she thought 'Wow, this is what I was praying for', and has enjoyed her time with us since Spring of 2018. Taylor is a recent import from Kansas City and has been enjoying her time in Des Moines. She has over 7 years of optical experience and has a passion for frame styling and personalizing lenses for each individual. Outside of work she enjoys spending time exploring restaurants around Des Moines with her significant other and spending time with friends, family, and Paisley the beagle. "I'm proud to call you both colleagues, and Valley Eye Clinic is, indeed, in great hands going forward. I know the two of you will make a great team, and with your knowledgeable staff, patients will continue to benefit. Congratulations from your friends at Johnston EyeCare!!" "Congratulations on retirement Larry. I can't claim to know you well, but I've always enjoyed our conversations." "Professional, friendly and reliable. Highly recommend Valley Eye Clinic." "Eye exam, and new glasses." "Dr. Swanger is the best. He has helped me through numerous visual needs." "Very thorough-good patient relationship. Explains well each procedure and reasons behind what's going on." "Excellent service! No wait time. I felt like I had a quality exam and Dr Swanger answered all of my questions and addressed my concerns"
"I believe I've been a patient of yours since 1977 and I want you to know that I've valued your expertise and the way you have always shown me how much you care about my vision and making sure you tell me all the advantages and disadvantages of my vision correction options over all these years! I sure do hate to lose you as my optometrist Larry, but I wish you the best as you wind down your career and move into retirement as I hope to do the same in a couple of years! Sincerely, Jeff Heuer"
"Dr. Swanger is a caring and dedicated Ophthalmologist. He is very thorough and explains what he is doing every step of the way. If you have a question about your sight, he will spend as much time as he needs to in order to answer your question and to make sure you are satisfied with his answer. The office staff all do a great job and seem to have a nice comradery with each other." "I always have a great experience with Dr. Swanger. He always answers all my questions and concerns. I always get seen right away at my appointment time and I never feel rushed, he always takes his time addressing everything with me." "I have been a patient of Doctor Swanger many years. He has my absolute trust- wonderful man & doctor." 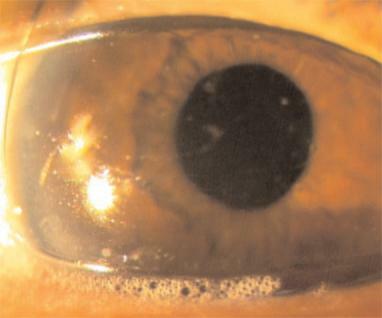 Blog #3: What is the different between anterior and posterior blepharitis?